The SUV wars are heating up among three of the newest family SUVs. What is the best 3-Row SUV for families? According to a three-way test by J.D. Power between the 2019 Chevrolet Traverse, 2019 Subaru Ascent and the 2019 Volkswagen Atlas, the three are close, but one is a clear winner. It may surprise you that all three of the newest Family 3-Row SUVs to hit the market are made in America. The Japanese Subaru Ascent is built in Lafayette, Indiana, the German Volkswagen Atlas is built in Tennessee, and of course, the Chevrolet Traverse is built in Detroit, Michigan. Among midsize SUV buyers, J.D. Power found 58 percent said that they prefer to buy a vehicle from a domestic company. What is the best 3-Row SUV for Families? 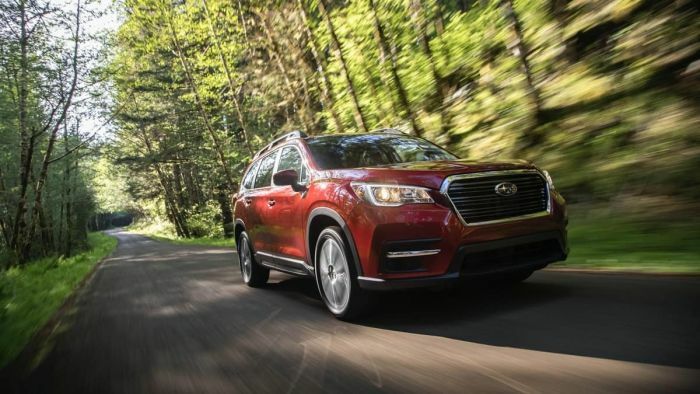 Although pricing was not a category in this testing criteria, Subaru Ascent is the clear winner and the best value among the three SUVs. The 2019 Chevrolet Traverse High Country with extra-cost paint has a price of $54,990 including the $995 destination charge. The 2019 Subaru Ascent Touring with a rear bumper cover and third-row USB charging ports comes in at $46,020 including $975 destination. The 2019 Volkswagen Atlas SEL Premium with no options is priced at $49,735 including the $995 destination fee. J.D. Power tested the three new family SUVs in four areas, Styling, Design, and Layout, Comfort and Cargo, Driving Dynamics, and Safety and Technology. The Chevy Traverse wins the Styling, Design, and Layout, VW Atlas takes the Comfort and Cargo category, Traverse wins out in Driving Dynamics, and the Subaru Ascent is the winner in Safety and Technology. Of the three newest family-sized SUVs, and in these four specific testing conditions, the Volkswagen Atlas edges out the Chevrolet Traverse and Subaru Ascent. The final scores are as follows: Volkswagen Atlas-87/100, ChevroletTraverse-86/100, and Subaru Ascent-83/100. It’s not a surprise Subaru Ascent would score the highest in safety. The Subaru brand has the highest IIHS crash test scores and offers their EyeSight driver assist technology as standard equipment on the new Ascent family hauler. Because each vehicle was tested in hot weather conditions, one area not tested in the J.D. Power SUV wars was the all-wheel-drive system. Subaru would likely score higher than Atlas and Traverse because of its 8.7 inches of ground clearance and Subaru’s X-Mode traction technology, the 2019 Subaru Ascent can go places the Chevy and VW can’t. So it all depends on what a family is looking for in a 3-Row SUV. If you need more room, the Atlas will be your best choice. If styling and design is most important, Traverse wins here. For safety performance and its “go-anywhere attitude, Ascent is a good choice for families with an active lifestyle. While traveling the interstate the other day, an Ascent passed me. My initial thought was about the styling of the vehicle. Unfortunately there was nothing styling-wise that made this SUV standout. It was just another SUV on the highway.